In addition to commercial and residential cleaning, we also carry out steam cleaning services for industrial customers in the East Midlands. From steam cleaning an engineering environment, to pressure washing in mechanical process plants, all cleaning is completed in full compliance with OH&S and HACCP standards. 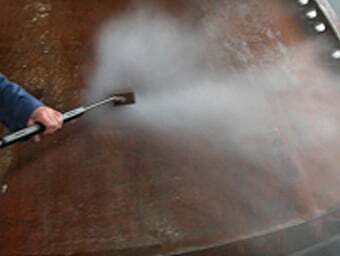 Our industrial steam cleaning services “degrease” and sanitise all surfaces using minimal amounts of water and cleaning chemicals, ideal for a broad range of industrial applications. Our high powered twin boiler system can reach 120 degrees to remove stubborn algae and dirt from sides of building that have built up over the years, first impressions count, How your premises look on the out side.